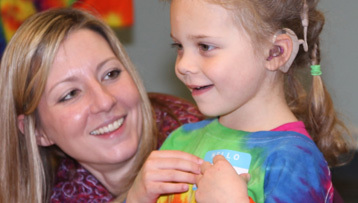 Did you know that children with hearing loss CAN learn to TALK??? This is the focus of the Oral Deaf Education Program at Buffalo Hearing & Speech Center. As 1 of only 7 Certified Moog Centers in the nation, this Listening and Spoken Language approach to teaching children with hearing loss makes age-appropriate language skills and mainstreaming into a district classroom a realistic option. The goal is for children to become proficient enough in spoken language to use it as their primary means of communicating. Intensive therapy sessions are provided to achieve individualized language goals and objectives for each child. Children are organized into small groups for very focused spoken language instruction for part of the day. The rest of their day is spent in a classroom that resembles any early childhood or preschool setting. Parent training and support groups are offered to help parent's understand deafness and their child's education. Upon completion of the program, our goal is to successfully mainstream children into classes with hearing peers. We continue to collaborate with Jean Moog, an internationally recognized leader in oral deaf education, to ensure the best outcomes for the children within our Program. We invite you to come in, tour the Program, meet the staff, and hear the chatter of the children! "Carissa was born shortly before Christmas in 2010. She came out perfectly plump and had beautiful color. Everyone was happy and excited. Soon after, that excitement turned to confusion and concern. Over the next three days, we were notified of “things that we not quite right” and will need to be followed up. Her right thumb did not appear to be developed and had a rubberized appearance, she had difficulty feeding due to not being able to turn her head properly and it was discovered that she did not respond well to the hearing test. Carissa was blessed to be part of the first year group of universal testing. Thankfully, these were all noticed within one week of her life so that we could act as soon as possible to ensure our baby girl can have the life that we all hope our children have. Within a relatively short period of time, Carissa was provided with Early Intervention Services. At first, we attempted to utilize these services in her daycare/home setting. We quickly learned that despite our efforts to obtain these services, the effectiveness was another matter. Carissa was provided with a hearing aid within the 1st year. At about a year, we requested she be evaluated for speech services. Using traditional daycare services did not appear to bode well for her. Often times, the hearing aid was removed. Since she was basically quiet, she didn’t appear to get much attention and it was clear that despite attempts by the Ot/Pt workers to utilize some of the therapy during her play time, she wasn’t making much progress. Thankfully, there was a solution that turned out to be a wonderful solution for our precious little girl. That solution was Buffalo Hearing and Speech. Carissa started the program at about 19 months old. We started seeing a change in her relatively quickly. She was given Speech and OT services. The OT services were wonderful in working with her needs pre and post surgeries. There was no local specialist to be able to handle the needs of my daughter’s hands. We traveled to Rochester for over a year and eventually received medical assistance through Boston Children’s Hospital. During all of this, BHSC provided us as parental tools to help her in the home and community. They worked as closely as possible to the recommendations of the medical staff and what was needed based on her assessments. Today, Carissa is able to utilize her skills in many areas and although she is still developing, she continues to amaze us every day. Despite her history of upper body weakness, she loves to dance and more recently has turned to attempting cartwheels and back flips. Carissa has been encouraged throughout this program. Her speech has improved leaps and bounds. Through parent observations, I witness that the teachers consistently encourage them to use their words. They often encourage at least 5 word sentences and provide positive reinforcement. At home, she never stops talking and is often the family reporter. As we approach our last year at Buffalo Hearing and Speech Oral Deaf Education Program, I am confident that the tools that Carissa has been provided with will help her in the long term. Her progress is so amazing. She has inspired us as parents in so many ways. I love to watch her work through her challenges and I love her strong personality. I thank all of the staff for their continued effort to ensure that our children are receiving quality education, therapy and support to help them have a life full of quality and self-confidence." For children birth to 3 years, families may contact their local Early Intervention Program. This contact information will vary depending on your County of residence. 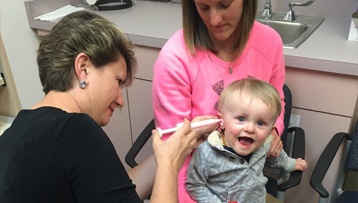 Your child’s audiologist can also help out with this process. For more information about the Program or to learn more about the process of enrollment, please contact Tracy Balon at 716-885-8318.